If you’re currently planning your wedding and you want something fresh and different for the reception, we got you. At Imperial Event Venue, we’ve see plenty of great ideas that have helped make receptions memorable. From creative ways to encourage guests to interact to keeping them comfy between dances, here are a few unique reception ideas that will definitely take your big day to the next level. Consider having interesting vendors during the cocktail (or “mingling”) hour. Incorporating even just one of these will stay in your guests’ minds for decades to come. 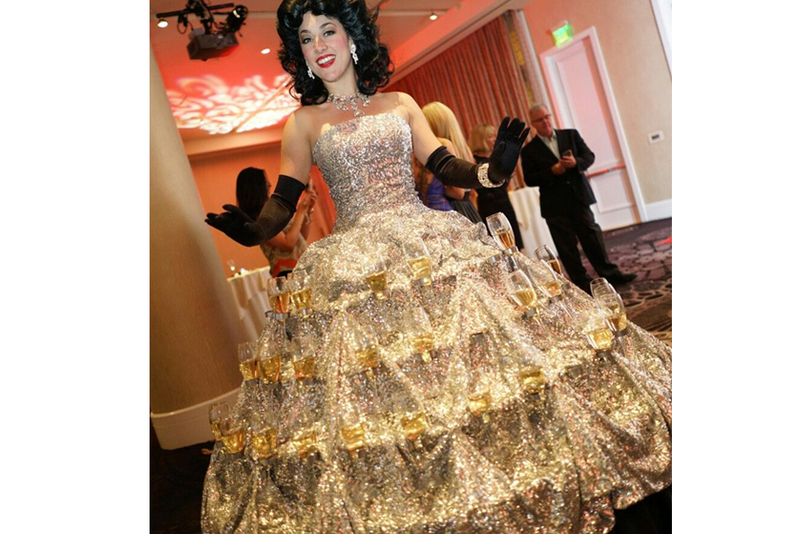 Great examples are strolling servers in champagne dresses and professional sketch artists. Having a show-stopping entertainer will always be popular at wedding receptions. 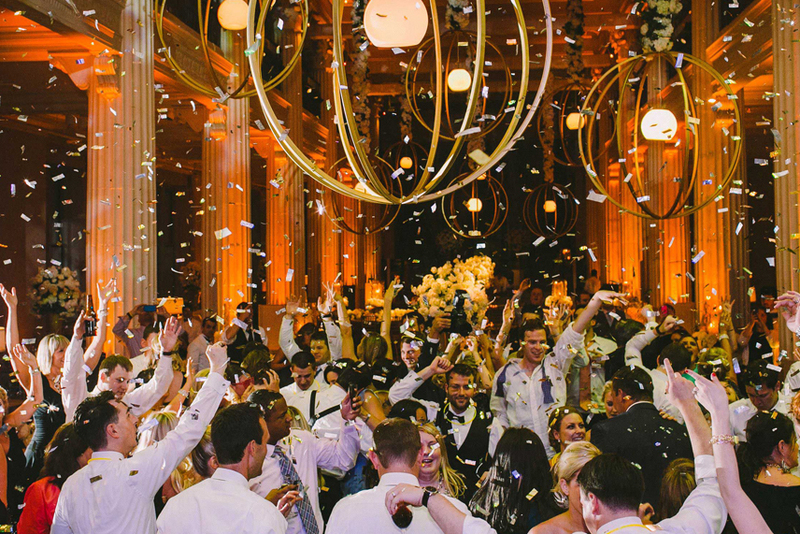 Whether it’s a choreographed dance number, a wedding magician, or even fireworks, having something unique and different for the wedding reception will have everyone talking for months. Some of the best that we’ve seen include contortionists, Brazilian samba dancers, an opera singer, belly dancers, and a short “play” performed by the wedding party which told the story of the couple’s meeting and courtship. Baskets of crayons, a scavenger hunt, teepees, Legos, a piñata—there are many ways to keep the kids entertained at your wedding reception. It just depends on how you want to do it. The key is to have something in place for them to do during the long hours of a reception. Some couples even choose to hire a babysitter or children’s entertainer to keep the kids happy in a separate “kid zone” area during their wedding reception. 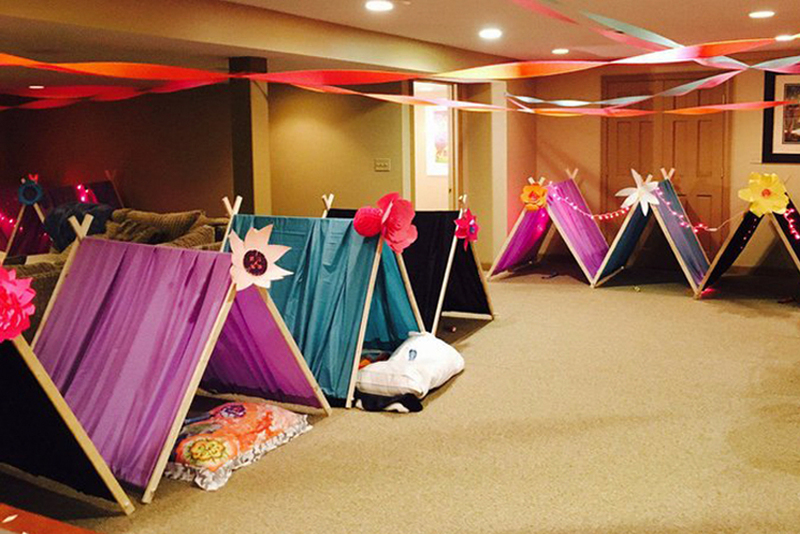 This area can be set up with art tables, movies, video games, snacks, or whatever else is perfect for a kid party. If you’re having a live band, consider something a little less ordinary than the typical choice. For example, a mariachi band covering the latest pop hits is a blast. A small group of gospel singers singing theme songs from romantic movies is awesome. A mini a cappella group singing several of the couple’s favorite tunes is brilliant. This is one unique reception idea that your guests will love. 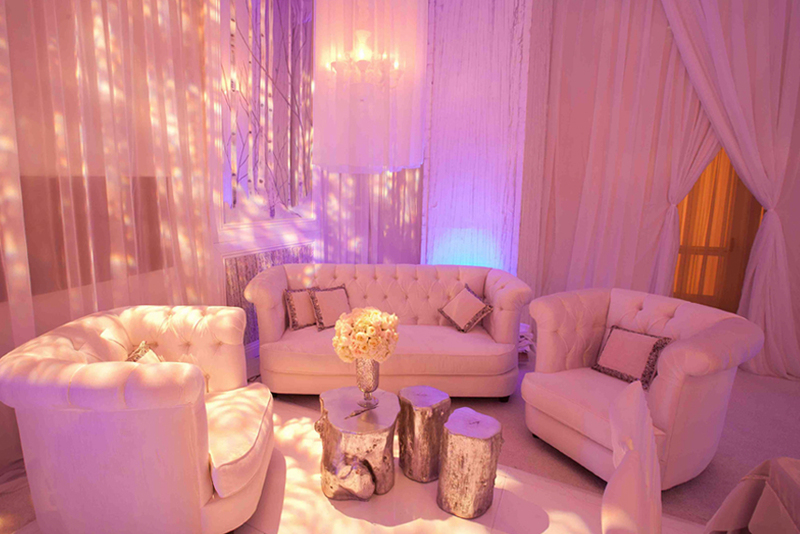 When your guests want to take a moment, catch their breath, and mingle between dances and the loud music, having a welcoming lounge area off to the side is a great option. This will help your guests take a relaxing breather while still feeling like they’re part of the party. An ideal lounge area should be quiet-ish, should have comfortable seating, and should be relatively close to the rest of the reception. Many great wedding venues offer this, so be sure to ask when you’re touring possible spaces for your wedding. Couples who have tried this service absolutely love it. SpeechBooth is a service that allows wedding guests to record messages, memories, toasts, or anything else they want on a video for the happy couple. The company sends you a lightweight box via mail that includes the minimal equipment you’ll need, then you just set it up and go! After the reception, you take the equipment apart again, mail it back to SpeechBooth, and they will send your edited video back to you within 30 days. Voilà! You will have a personalized video with well wishes from your wedding guests. Having the option for confetti to drop at some point of the reception is so much fun. The big moment can happen during a particularly popular song that has everyone on the dance floor, or perhaps during the couple’s reception entrance. Confetti out of nowhere is always a big, surprising crowd-pleaser. 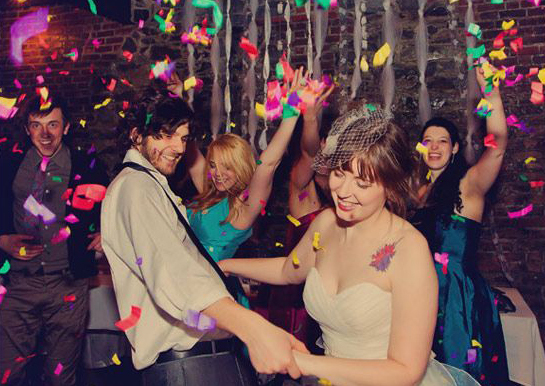 If your venue doesn’t have a confetti-drop feature, consider hiring a confetti cannon specialist. 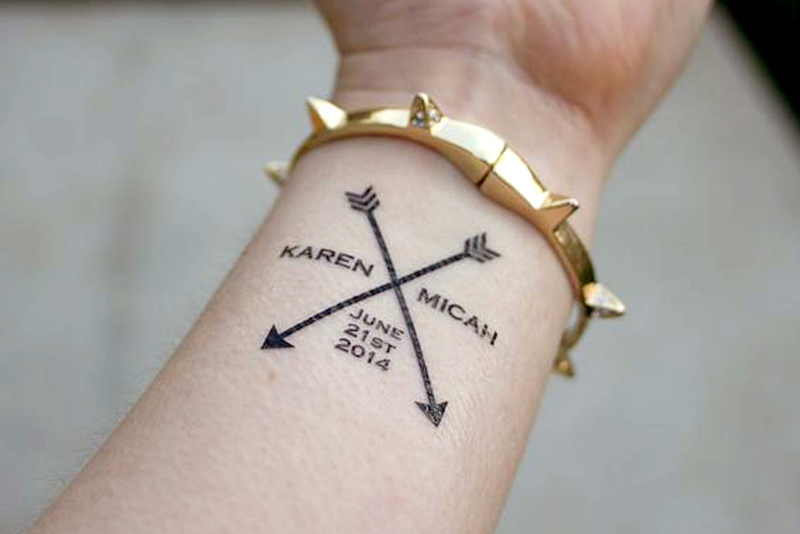 Colorful mustaches, heart-shaped sunglasses, temporary tattoos of the couple’s initials, Hawaiian leis, customized baseball caps—wedding favors can indeed be fun and wearable. By giving out wedding favors that can be worn immediately, you’ll have plenty of fun photos of your guests enjoying them during the festivities. Long after the caterers have packed up and gone, very often the wedding reception continues to go, go, go. So why not treat your remaining guests to a delicious late-night snack? You can arrange for a popular food truck to swing by, or you can have someone deliver whatever you’d like. Trust us—your guests will be very appreciative. As one of the most popular wedding venues in the Los Angeles area, our team at Imperial Event Venue gets to experience all sorts of beautiful and unique reception ideas, and it’s always amazing! If you’re currently looking for an extraordinary wedding venue, feel free to check out a virtual tour of our venue, or simply contact us to learn more.